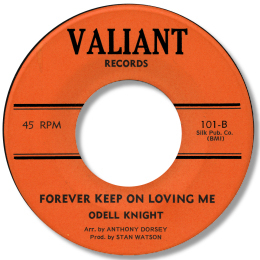 Another one of those unfortunate “who?” artists, this seems to have been Odell Knight’s only 45. But what a record it is. Starting off with a phrase or two from a rich horn section, a classic deep soul arpeggio guitar leads Odell in to plead for love. He’s clearly been listening to Otis Redding in both phrasing and intonation but that’s no bad thing! The horns keep him company as he starts to cut loose at the end completing a performance to savour. I’d guess this was cut around ’66 or ’67 and the names of arranger Anthony Dorsey (a superb job here) and producer Stan Watson on the label indicate a Philly location. But this is about as far from the Delfonics as you can get and still be in the same genre.